Iranian warships will accompany a humanitarian aid cargo vessel bound for Yemen, as Tehran is wary that it could be intercepted by Saudi forces. It is heading to the port of Hodaida, which is held by Shia Houthi rebels. The Shahed cargo ship departed Iran on Monday and is currently in the Gulf of Aden. “The 34th fleet, which is currently in the Gulf of Aden, has special responsibility to protect the Iranian humanitarian aid ship,” Admiral Hossein Azad said, according to the state IRNA news agency. He was referring to a destroyer and support vessel, which are patrolling international waters off Yemen. 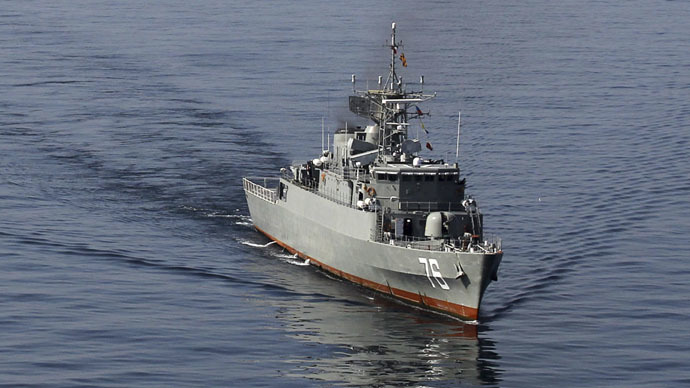 Tehran says the warships are necessary in case Saudi-led coalition forces try to intercept the humanitarian cargo ship. Saudi Arabia has launched a naval blockade of Yemen, which is part of its campaign against the Houthis. Meanwhile the US on Tuesday warned Iran against “provocative actions,” saying it was tracking the Iranian warships. The White House spokesman urged Iran to use a United Nations distribution hub in Djibouti to provide its humanitarian assistance. A five-day ceasefire is set to come into effect at 8:00pm GMT on Tuesday, which will allow food and medicine to be brought into the war-torn country. Aid groups say that Yemen is facing a humanitarian catastrophe. The Saudi Foreign Minister Adel al-Jubeir said on Monday that the truce in Yemen may be extended if "(aid deliveries) succeeded and if the Houthis and their allies don't engage in hostile activities,” according to Reuters. Iran has insisted the cargo ship is only carrying humanitarian aid. The country’s FARS news agency says that seven activists from the US and Europe are onboard the vessel. The ship is registered to the Tehran-based company Valfajr Shipping. On May 7, Tehran released a Marshall Islands-flagged container ship and its crew, after the vessel had been seized in the Strait of Hormuz shipping lane. The vessel was diverted on April 28 because a one year old debt case with the ship’s charterer Maersk Line had not been settled. “Rickmers Group is pleased to report today its managed container vessel Maersk Tigris with 24 crew members on board has been officially released by Iranian authorities following an order from the court in Bandar Abbas, Iran,” the operator and manager said in a statement, which was cited by Reuters. Saudi Arabia has accused Iran of trying to arm the Shia Houthi rebels and the coalition has said it intercepted cargo ships bound for Yemen on a number of occasions. In April, coalition planes bombed the runway at Sanaa airport to stop an Iranian cargo plane from landing. However, just hours before the ceasefire’s beginning, Saudi-led coalition forces pounded the Yemeni capital Sanaa, which is controlled by the Houthi forces. Meanwhile, airstrikes by the coalition on a racket base in the capital on Monday killed 90 people and left a further 300 injured, according to a local official, cited by Reuters. Adrian Edwards, a spokesman for the UN refugee agency UNHCR said the organization was set to carry out humanitarian missions, with planes taking-off from Dubai in the United Arab Emirates. They will be carrying 300 tons of sleeping mats, blankets and tent material. “The UNHCR is making final preparations for a huge airlift of humanitarian aid into Yemen's Sanaa, to take place over the next days if todays proposed ceasefire comes into effect and holds,” he told a briefing in Geneva on Tuesday. Yemen which imports more than 90 percent of its food, mainly by sea, has been struggling to feed the population for weeks. In April, Reuters reported that at least five merchant ships were not allowed to pass. Only two or three of those vessels have been able to offload their cargo, ship tracking data and shipping sources told Reuters. A report by the UN agency OCHA on April 6 said that 1,527 people have died so far in Yemen as a result of the conflict. Among the dead are 646 civilians, while 6,266 have been wounded.